On Checkout 51’s list this week (Sept 26-October 2, 2013) is Club House Recipe Mix, Any variety. 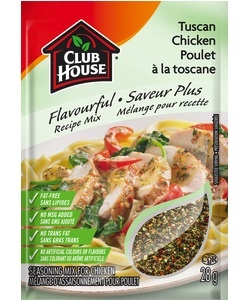 Make innovative, restaurant style meals quickly and easily with Club House Flavourful Recipe Mixes. You will get $0.75 cashback rebate at Checkout 51. Here’s a pic of what it looks like. I found a couple prices of it at a few stores. I didn’t find any other Club House Recipe Mix coupons to use. Checkout51 offer expires midnight Wednesday October 2, 2013. You must purchase in Canada and upload your receipt between Thurs Sept 26-Oct 2, 2013 to qualify for the cash back rebate. Check out here for more Checkout 51 cash rebates for this week.